The Pirates lost by 25 points on aggregate, the second year in a row that they have fallen at the Championship's final hurdle. "We want to be the bride, not the bridesmaid," Davies told BBC Cornwall. "Hopefully we can build on tonight, we've picked up some new recruits for next year, hopefully we can have a few more to strengthen us." And Davies says the new format of the Championship, with the top four sides going straight into a play-off system rather than the top eight playing in two pools, means there is more pressure on the first phase of the season. "It is that strength in depth you need with the new format. "There's going to be a lot of pressure on every game so you need quality throughout." 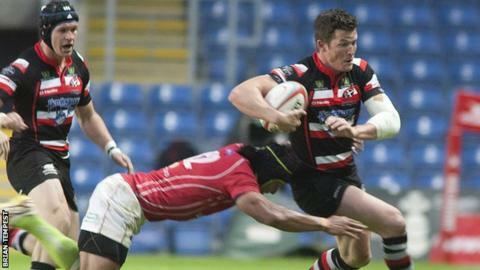 The Pirates were not able to gain promotion to the Premiership even if they had beaten London Welsh over two legs, as their ground does not meet Premiership criteria. But Davies says that he would have liked his side to have won the title as many of them - such as Drew Locke,Carl Rimmer and Dave Ward - played their final match for the club before heading to the top flight. "Two years, two losers medals, both finals lost by 25 points over two legs, so the team are disappointed. "There's obviously the thought that a few of the guys are moving on and it would have been nice to go out on a win."